One of our favourites for early spring colour and one of the first bulbs to emerge with an abundance of contrasting colours borne in succession from as early as January. One of the best for naturalising too. 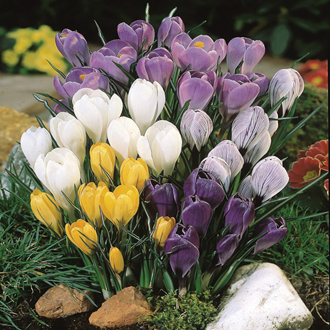 Signifying that spring has arrived, bulbs create splashes of colour throughout the garden and they are perfect for planting into patio pots and window boxes. Easy to grow and care for, they will bloom with the minimum of attention and are great for cutting too. We have trialled and tested all of the bulbs we sell and work closely with our growers to ensure we offer the very best, top-sized bulbs available to produce a wonderful spring show.